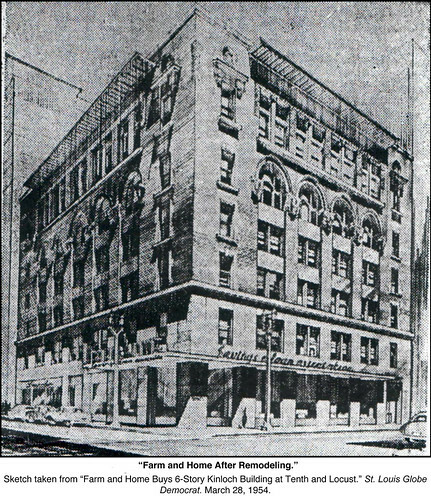 Another example of an early 20th century building Downtown that received a new modern slip cover is the Farm & Home Savings Association at 10th and Locust. The current modern skin was applied to the building in 1954. 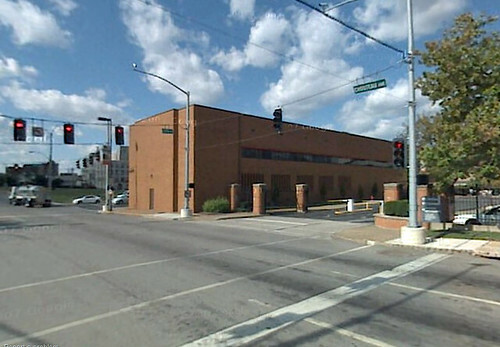 Farm & Home had purchased the building for its new St. Louis headquarters. The six story building was originally constructed in the Romanesque style in 1905 as the central exchange for the Kinloch Telephone Company. 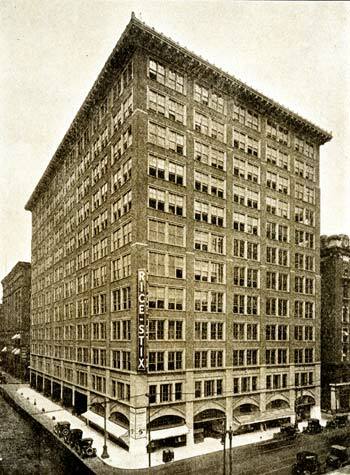 In 1900 Kinloch had surpassed the rival Bell Telephone Company in number of subscribers, making it St. Louis' largest telephone company at the time. Kinloch sold out to Bell in 1924. Back to the question of whether a "modernized" building can be restored to its former appearance. The answer as seen in my previous post is: sometimes yes, but in this case, the answer is sometimes no. 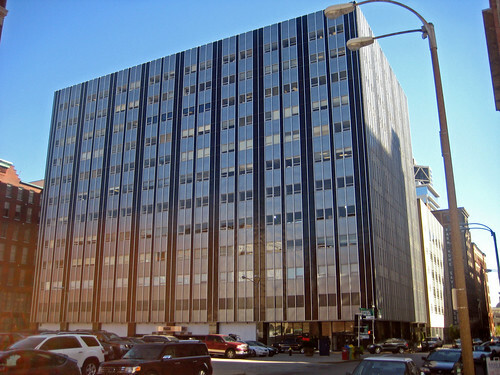 Both the former Post-Dispatch Building and the 1015 Locust Building are both examples of modernizations that were accomplished by hanging an aluminum and glass curtain wall on the building. As the name implies, the new window and metal panel systems were hung on brackets attached to the masonry structure and like a curtain, there was a small amount of space between the new wall system and the building. 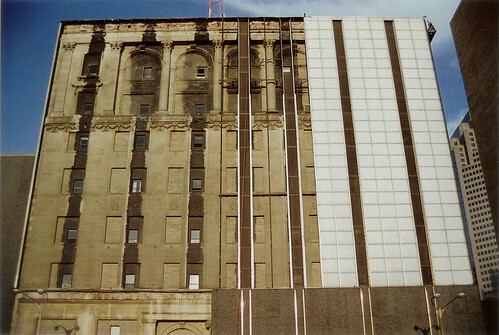 In the case of the Post-Dispatch, this allowed the curtain wall to slip over many decorative elements that protruded from the face of the building. This allowed for removal and restoration of the areas that were damaged. In the case of the Farm & Home Building, a new stone veneer and metal panel system was applied directly to the face of the the original building. This meant that all decorative elements including arches, sills, band courses, cornice, etc. that protruded beyond the face of the field masonry were literally shaved clean off of the building. When Craig Heller bought the building several years ago, he had several of the stone panels removed to investigate the possibility of restoration. 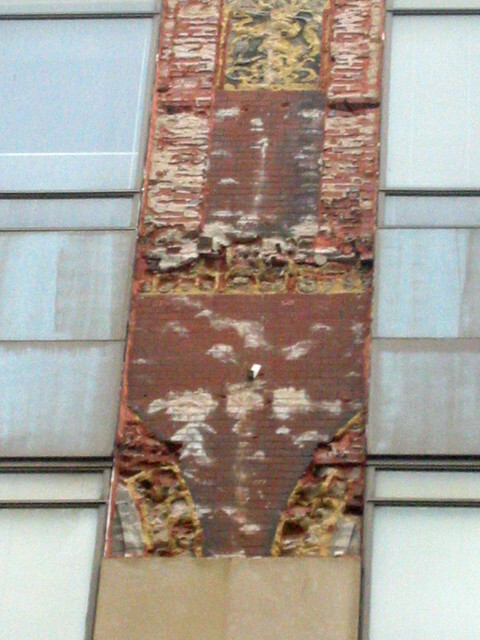 As you can see from the photo above, the damage to the brick and terra cotta decoration was extensive. Restoration would have meant a very expensive complete re-construction of all the decorative elements from scratch. Even if the money were available to do this, when damage is this extensive you have to ask yourself "is it worth it?" much of the original detail of the building intact. Because the Farm & Home modernization had been completed in the mid-1950's, the new skin was able to be considered to have achieved enough significance in the building's history that it was listed on the National Register with the modern facade. 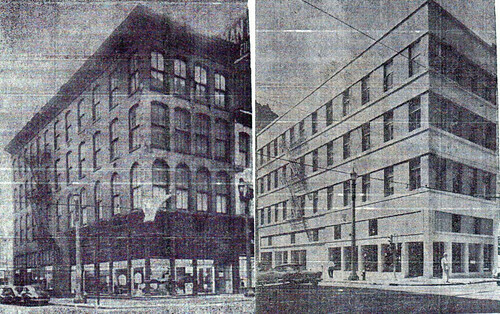 The original Kinloch Building photo, rendering above and three side by sides below are all from the building's nomination. 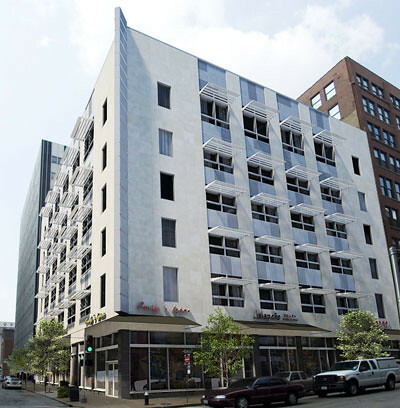 After World War 2, there was a wave of building modernizations in Downtown St. Louis as owners wanted to both "update" the look of their properties and compete with new construction. The building above was at 6th & Olive. Another modernization above at 526 Pine Street and below at 1100 Olive. All three of these "before and after" examples have since been demolished. 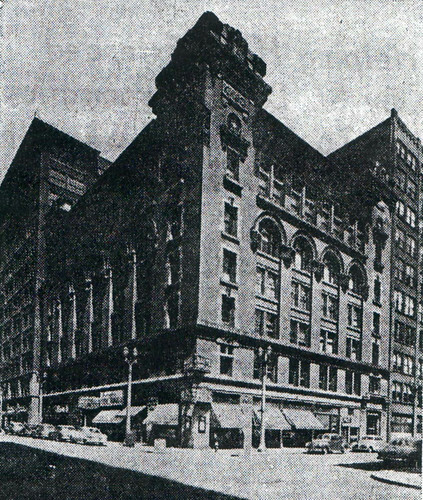 Further east at Broadway and Locust is another example of a prominent building that was modernized in the mid-1950's was the Mercantile Library Building. St. Louis' oldest cultural institution, the Mercantile Library was founded in 1846 and is the oldest continually operating library west of the Mississippi. 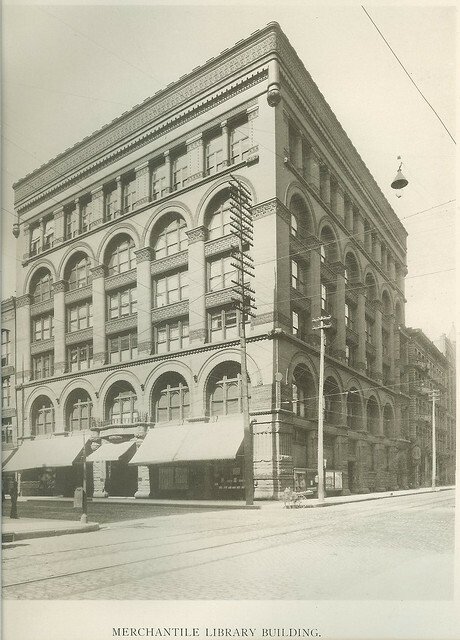 In 1854 the Mercantile Library built its first building at Broadway and Locust then in 1887 began construction of a larger six story building on the same site which was dedicated in 1889. In 1955 the building received a modernization very similar to that of the Farm & Home Building. A granite base was applied to the first floor, limestone veneer wrapped its midsection, and finally red brick was applied to the 6th floor and a severely truncated parapet compared to that originally built. The modernization also included a large new addition to the west of the original building as well as the incorporation of a neighboring building to the south an another facing 6th Street to the west. 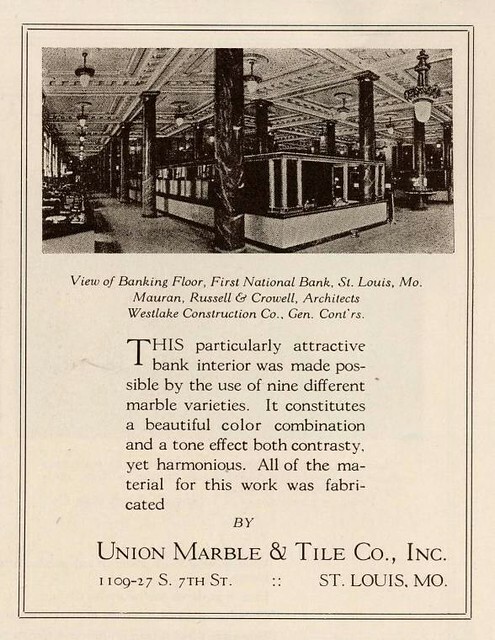 An old advertisement fro marble ant tile shows the opulent interior of the First National Bank of St. Louis which was a main first floor tenant. An image from the Missouri History Museum shows the buildings exterior covered in patriotic bunting on the bank's opening day, July 7, 1919. 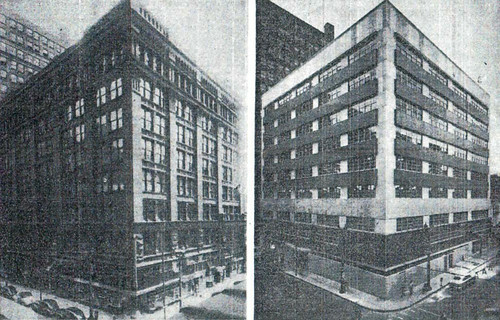 Prior to construction of the Century Building, Scruggs Vandervoort Barney had also been an early tenant. This is all that is left of that interior today, although much of the original interior was probably gutted and covered over during the buildings expansion and modernization in 1955. 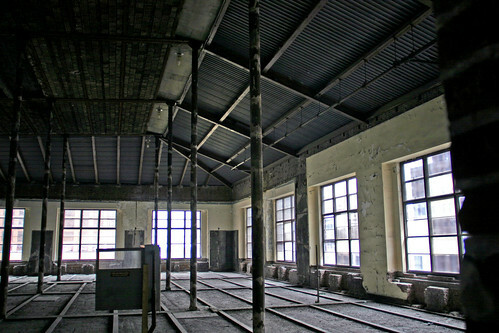 A photo shows how the large arched windows on the second and fifth floors were partially filled-in during the modernization. Unfortunately the method of attachment of the stone panels here at the Mercantile Library was the same as that of the Farm & Home. All of the decorative features were shaved off to give a clean flat surface for hanging the new stone. Pyramid determined that even if we had wanted to restore the exterior that because the building had lost so much of its original fabric both on the exterior and interior, including almost complete removal of the south and west walls during expansion, that the original 1889 building would not be eligible for listing on the National Register. A century after it erected its fortress of knowledge, the Mercantile Library found itself an aging institution with dwindling resources. The library was private and relied on memberships and contributions to sustain itself. 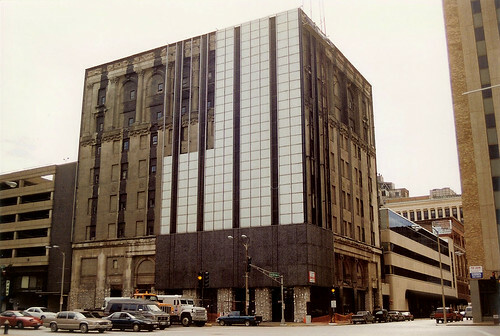 With a glut of new office space in Downtown St. Louis after the 1980's building boom, the library also found itself almost the only occupant of its now 250,000 square foot building. Instead of closing its doors, in 1998 the Library made the decision to move to the University of Missouri St. Louis campus. Gone is the once opulent sixth floor reading room and the mezzanine library stacks. Like the Farm & Home, the Mercantile Library is eligible for listing on the National Register as a modern building. With this and a now a blank canvas inside, the building is ready to live its next life when the economy is ready. 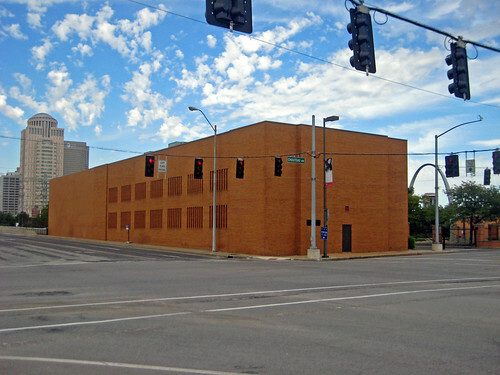 Comments on my previous post about the building at the northeast corner of Tucker and Chouteau inspired me to find some photos I took of the former Post-Dispatch Building several blocks north at Tucker and Olive. 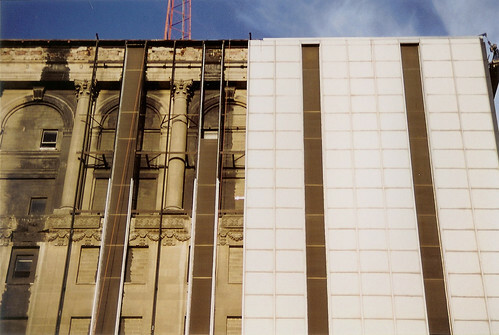 Many of you probably remember this dramatic transformation in 1999, when the metal curtain wall slip cover was removed revealing the stone facade beneath. The hidden Beaux Arts Classical designed building by George D. Barnett (who also designed the Arcade Building) had been completed in 1917 as the new home of the St. Louis Post-Dispatch, the leader amongst several competing St. Louis newspapers. 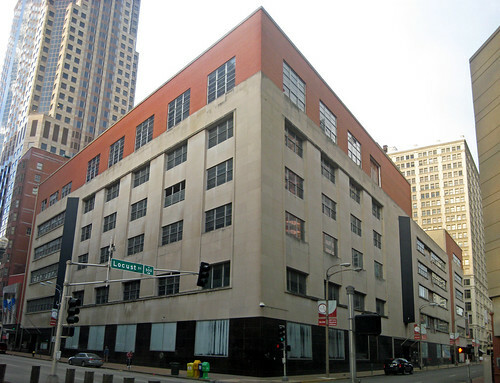 In 1960, the Post-Dispatch vacvated the building, moving to a larger building several blocks north at 900 N. Tucker Boulevar. New owners of the building must have been looking for a way to compete against newer modern office buildings rising Downtown and in the emerging business district of Clayton. Their answer was to fill in all the large windows with cinder block, cover the upper floors with a metal curtain wall and encase the lower two floor with black pre-cast concrete panels. The tiny remaining window openings were less than a quarter of the original size and hidden by metal mesh strips in the curtain wall. Thirty four years later, in 1999, the re-muddling was stripped away and the building was placed on the National Register. Historic Tax Credits were used to fully restore the building including re-building missing stone details and parts of columns at the first floor, new historic replica windows and storefronts. While the original balustrade parapet was not re-built, a new cornice made of modern materials to resemble stone was included. 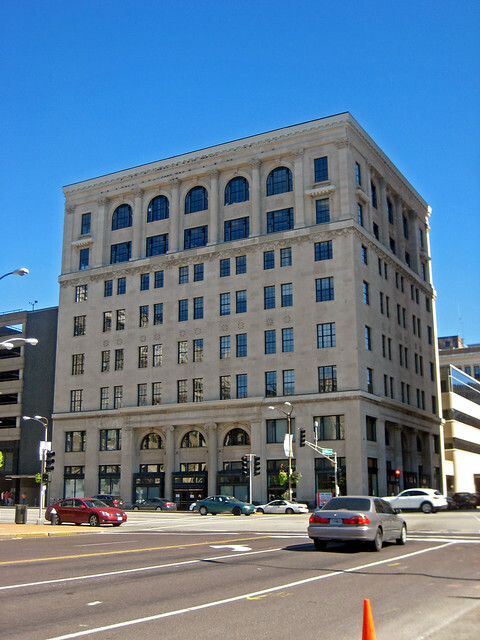 The former Post-Dispatch Building today. Other than some slight color variations in the decorative band course between the sixth and seventh floors, one would never guess that this beautiful building was hidden for over three decades. 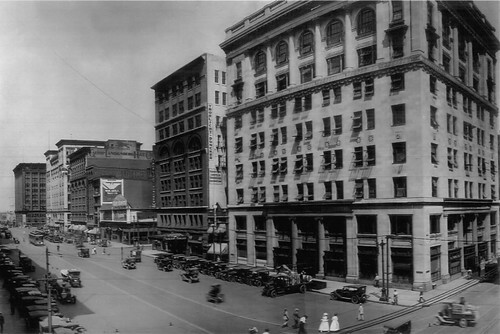 Tucker Boulevard circa 1917 - Photo from the building's National Register nomination. The nine story building to the north as well as the tiny two story between have been replaced by a parking garage. Farther north, the former A.D. Brown Building, now the Meridian is the only building that has not been demolished or truncated. 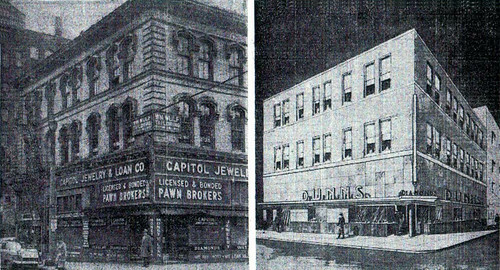 One block to the north and east at the northeast corner of 11th and Locust is another building early 20th century building which was "modernized". The Locust Building, which is home to the City's Community Development Agency and the St. Louis Development Corporation, at least retains the same number of windows as it did originally, although the height of the windows was reduced to a dimension slightly taller than the brick bands between the originals. There are no plans to unsheath this building, in fact the current owners have made some improvements in the last few years in keeping with the current modern design of the building. A photo of the building prior to its covering with aluminum curtain wall. 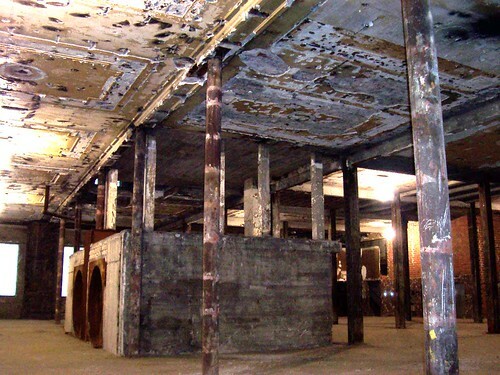 The photo is from the former owner's now defunct website which gave a brief history of the building. The concrete frame structure was built as an annex for the giant Rice-Stix dry goods company which had previously built the Merchandise Mart building on Washington Avenue. A five story bridge still connects the upper floors of the two buildings. Rice-Stix also built an annex that now houses the 10th Street Lofts. 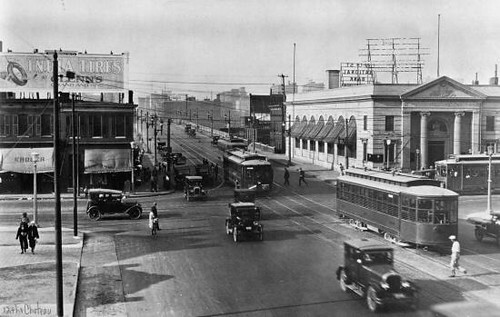 I was recently looking at a collection of historic Route 66 photographs including St. Louis when I stumbled upon this view above of 12th and Chouteau from 1925. 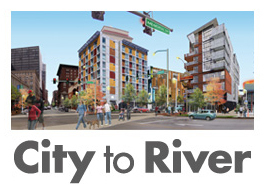 I immediately thought of the nearly blank orange brick box that sits at the northeast corner of the intersection. The way it hugs Chouteau and the entrance of the Tucker Boulevard viaduct heading into Downtown had always made me suspect that it is older than it looks, but never did I imagine that the building began its life as the beautiful neoclassical bank pictured above. According to City property records, the bank was constructed in 1924. 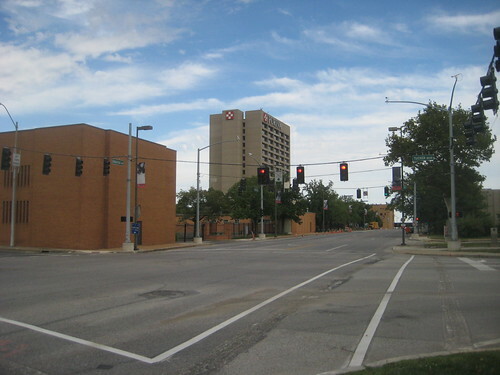 At some point, in the late 1960's or 1970's the building became part of Checkerboard Square, the headquarters of Nestle Purina, and was sheathed in orange brick to match several other buildings on the corporate campus. 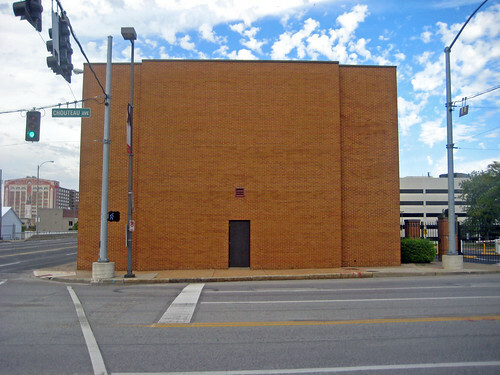 A steel security door centered on the blank brick front of 1111 Chouteau gives little clue of the former columned grand bank entrance. Only the projection of the center of the facade follows the form of the hidden architectural details. 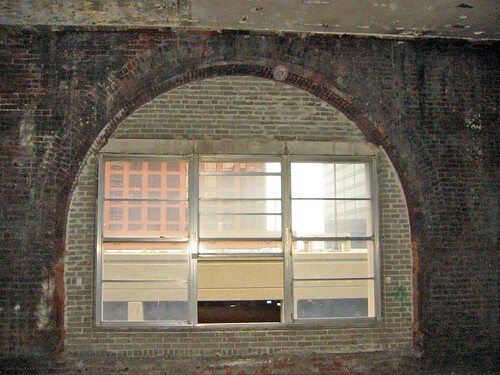 The seven double height arched windows which faced Tucker and no doubt opened into a grand 2-story banking hall have been reduced to a series of brick bars giving the building the appearance of a jail. 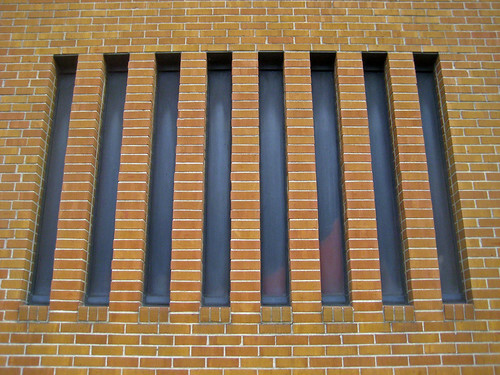 The east facade is not much better, with the brick bars continuing at the ground floor and a thin slot of strip windows at the second floor, which was likely inserted into the bank hall. I wondered what could be housed in this horribly re-muddled brick box? Maybe computer servers?, maybe the campus maintenance department? There is no signage on the public facades of the building even indicating it is part of Purina or what it contains. I was quite surprised to learn after a quick Google search that 1111 Chouteau is home to Checkmark Communications, Nestle Purina's in-house creative communications and design agency. What!? The staff of "creative communications and design agency" of a major corporation are housed in this thing? Maybe there would be more creativity going on if the orange brick skin was ripped off and those wonderful large windows opened again.